Placing 2D objects in 3D space is very simple using Sony Vegas with the Bororo 3D plug-in. Here we will see how I created the Happy 2010! video in just a very brief time on New Year’s Day 2010. I started by deciding how many text layers I was going to use. Since I did not have much time, I chose to limit myself to four. 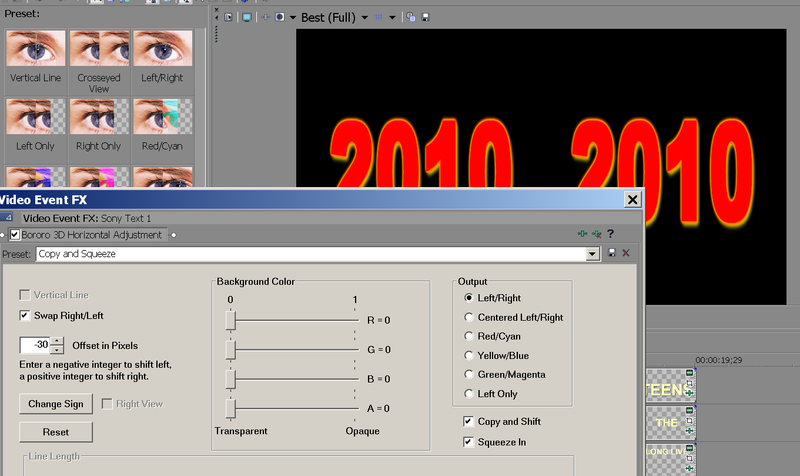 A background layer with the number 2010 and three foreground layers for the best wishes. 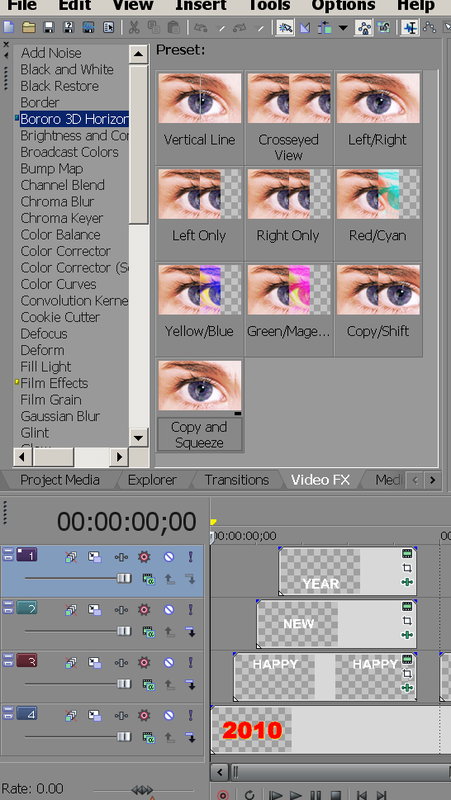 Since Sony Vegas superimposes each video track above the one(s) below it, I created four video tracks. 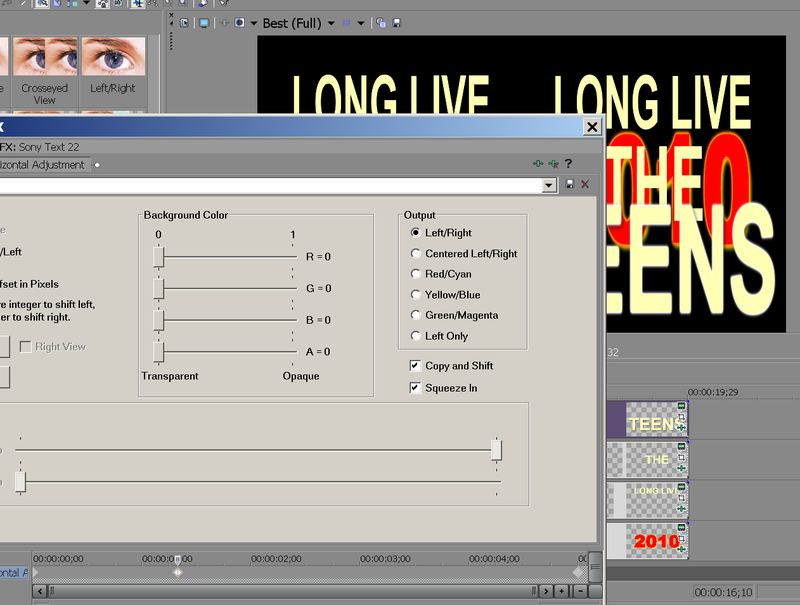 With the Media Generators I created all the text, placing the big and colorful 2010 at the bottom track, which I extended all the way to the end of the video. I typed in 10 minutes as the duration of all the text regardless of its actual duration. This is because otherwise Sony Vegas would assume it is five seconds long and any key frames used in it would be repeated every five seconds, not what I wanted. As you can see at the right end of the top track, I used Sony Vegas key frames to move the word teens from the bottom of the screen to near the middle. When I was satisfied with the placement of all text in the 2D plane, I started moving it three dimmensionally. From the VideoFX pane I chose Bororo 3D Horizontal Adjustment, then dragged the Copy and Squeeze effect on the bottom track, the one with 2010 on it. I made sure the Vertical Line box was not checked and both the Copy and Shift and Squeeze In boxes were. I also made sure the background color was set to black with the Alpha Channel set to 0 to make it transparent, though the transparency made no difference here as this was the bottom track. But doing so does make a difference on the tracks that are above any other track(s), and it is a good habit to do at all times. Note that the Reset button sets the value to 0 and the Change Sign changes a positive number to negative and vice versa. Because I wanted to post the video on YouTube, I needed to produce a half-width output with the right half on the left and the left half on the right (YouTube likes it cross-eyed), so I selected the Left/Right type of output at the right end of the dialog, and clicked the Swap Right/Left box on its left side. I repeated the process with all the rest of the generated text, using key frames (at the bottom of the image below) to change the offset, so the text would move in or out, producing the illusion of it moving through all three dimensions. So, even though the text itself is two-dimensional, the video is quite three-dimensional. Naturally, this effect is not limited to text. I used it with old black & white photographs to create When I Was… a video showing me at different ages of life. You could also use it to create animations of two-dimensional drawings moving about different 3D planes. The possibilities are only limited by your imagination. And that should be no limitation at all!